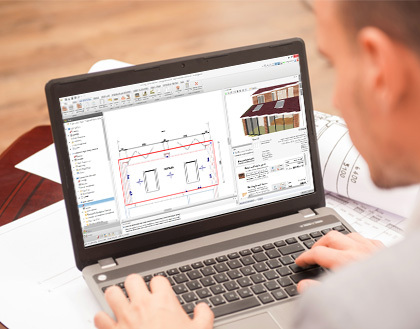 Have you seen a software review of instant estimates as you draw a plan? There are lots of software reviews on the subject of estimating software and design software/CAD software. However, very few about the integration of the two. That’s really because they’re few and far between! In fact we haven’t come across a software system other than BuildingWorks that give small to medium sized building firms live costs as you draw. We think we will have the monopoly therefore on software reviews in that department! AutoCAD and TurboCAD, neither products give you a cost breakdown of the design. We’re looking forward to sharing software reviews of BuildingWorks as new subscribers come on board. The response so far to the subscription-based software platform has been fantastic. We constantly review the feedback that we get from the 14-day and 30-day trials and of course the reaction of businesses when they go on to subscribe to the software. So far the Design and Estimate Professional Suite has been proving the most popular combination. It is currently available at £58 + VAT per month. That’s the equivalent price if you subscribe for 24 months up front. Professional Housebuilder and Property Developer magazine have recently conducted a Q & A with Adrian Wild the founder of BuildingWorks from Integro Construction Software, and there are plans for key industry publications to provide their own software review once they have had a chance to trial the clever BIM software system. In fact it’s the BIM aspects of the software platform that are creating a great deal of interest across the industry and we look forward to a software review that looks at the potential the estimating and design software represents with its huge rates library. For more information call 0117 916 7880 or sign up for a free software trial here.